The word 'labyrinth' and the word 'maze' mean much the same thing. 'Labyrinth' is a Greek word; 'maze' is from Scandinavia, and both words were used in period. There are two basic types; either a single long, meandering path, or multiple connected paths. During the medieval period it was well known that labyrinths were easy to get lost in, but evidence suggests that by far the more commonly constructed type is a single path as opposed to the many intersections of modern mazes. Labyrinths are an old concept. The earliest known labyrinth was a stone building in Egypt. It was built around 2300 BC by King Amanemhat III, and measured 1000 by 800 feet and stood two stories tall. The building had 12 large chambers with many smaller rooms and twisty little passages all alike. The building may have been used as a temple and meeting place for the nomes (rulers of portions of Egypt). Unfortunately most written accounts describe the Egyptian Labyrinth only after it was ruined by the Romans. The Cretan Labyrinth, according to legend, was built around 1580 BC. King Minos had it built at Knossos by a clever man called Daedalus to house the minotaur, and regularly threw young Athenians into it as sacrifices. A lad by the name of Theseus used a ball of string to mark his way into the labyrinth, killed the minotaur, made his way out again, and nicked off with King Minos' daughter. Archaeologists have found many single-path labyrinths and bull-cult symbols in artwork from Knossos, though whether the labyrinth really existed (and if so where it was) is still debated. The Cretan labyrinth design found in Minoan artwork can be drawn by a game of sorts. Start with the cross figure on the left in Fig 1, and draw a curve to connect the bottom of the cross to the end of the L next to it, then proceed to connect the rest of the end points together by drawing larger and larger arcs until all external end-points are used up. The lines form the walls of the maze, and the path alternates back and forth around the circumference. This can also be drawn with straight lines to form a rectangular figure. Examples of both the initial cross figure and the final labyrinth have been found in Bronze age artwork throughout Europe, the Middle-East and parts of Asia, with similar ones in North and South America from about the same time. Fig 1: How to draw the Cretan Labyrinth. Labyrinth patterns were also popular in Roman mythology, and quite complicated single-path labyrinths exist in Roman mosaics from 100 to 500 AD. Single-path meandering patterns are often found as border designs on Roman pottery. Fig 2: Design of a labyrinth from a Roman mosaic in Cormerod, Switzerland. The actual mosaic depicts Thesius fighting the Minotaur in the centre. Fig 3: Example of a maze-like Roman border design. The story of Theseus and his string was quite popular in medieval times, and there are many examples of artwork depicting the more famous elements, such as Theseus battling the minotaur in the centre of a labyrinth. 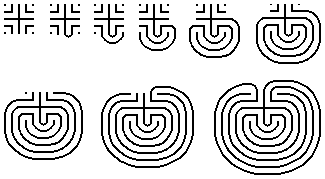 Most of these show a single path labyrinth, though of a different form to that found in Crete. Notably the medieval design is based on concentric circles with a cross superimposed, and the path zig-zags through the quadrants of the circle. Fig 4: How to construct the typical 12th to 14th century labyrinth design. Single-path labyrinths are generally held to be of symbolic or meditative use. Although at first glance they appear complicated, with patience a person may easily find the centre. The allegorical meaning of the labyrinth was probably the difficulty of keeping to the one true path without getting distracted and loosing your way. This labyrinth, and ones like it, can be found built into pavements in French and Italian churches dating from the 12th century, such as at Chartres Cathedral. Exactly why they were laid is not known, however it is likely that they were trod (possibly on one's knees) as a symbolic pilgrimage, in lieu of going on a real pilgrimage or even a crusade. Smaller tile labyrinths set in church walls that could be traced by finger would have made the pilgrimage even easier. The cross and the number of rings (11 or 12, depending on how you look at it) may well have held religious significance, enough to make this design a favourite. Labyrinths did not catch on as church decorations in Britain, but turf labyrinths were quite common. Rather than walls, turf labyrinths had shallow trenches delineating the path, and the whole labyrinth was usually surrounded by a slope. Mostly these follow the same design as that featured in medieval artwork. Lads would show off their skill to the local maids, by competing with one another at running the path, with onlookers watching from the surrounding slope. Turf Labyrinths are commonly found near churches and old Roman earthworks and there is reasonable evidence that they have been around since Roman times at least (Matthews, p 94). The paths and separating trenches can be 1 to 3 feet wide, the trenches about 6 inches deep, and the goal at the centre is usually circular, maybe 18 feet wide. The grass in turf labyrinths gets worn away if too many people use it in a short space of time. The trenches need to be periodically re-cut to keep the path well defined. Some existing turf labyrinths have been modified, restored or possibly even constructed in the first place by people unsure of the original plan. For example, labyrinths exist where the path is the trench, and the one at Hilton is missing the inner-most paths, making it easy to get to the centre, where a stone monument has been placed. Fig 5: Turf labyrinths from Hilton and Boughton. Fig 6: Turf labyrinth pattern used by Welsh shepherds, as recorded by P. Roberts in Cambrian Popular Antiquities in 1815. Not all turf labyrinths are circular; they can be square or even triangular in overall shape, and they can be based on the Cretan design, or something completely different. Old turf mazes tended to be called things like "Troy Town", "Julian's Bower", "Sheppard's Race", "Jerusalum's Walls" and in Wales "Caerdroia" (The walls of Troy). These are similar to turf labyrinths, but are found in Lappland, Finland and Sweden. These are paths delineated by stones and pebbles, and are more commonly based on the Cretan pattern. Like the turf mazes of England, these were also used for running games, however it may be that they have been around for a lot longer, probably from the Bronze Age. Many of these stone labyrinths are also named after Middle-Eastern towns. From early in the 16th century formal gardens included herbal and flower beds separated by paths. These were based on geometric patterns, some of which were quite maze-like though it was easy to see where the paths led. Garden fashion changed over the century, and topiary shrubs and hedges were added to the flowerbeds. Fig 7: A layout for 16th century garden beds, with a fountain at the centre. Fig 8: Herbal labyrinth design by Jan Vredeman De Vries, published in Hortorum Viridariorumque Formae in 1583. The walls of the labyrinth are garden beds, with taller plants at the ends and connections of the beds and a tree in the centre. In the latter half of the 16th century flower, herbal and hedge mazes were a common feature of estate gardens throughout Europe. While all existing hedge mazes were planted in the 17th century or afterwards, there are many period paintings and garden designs that include hedge mazes. Most of these are single-path mazes, though towards the end of the 16th century hedge mazes with multiple branches can be found. In the 17th century it became more popular to have non-geometric designs and wandering paths, with statues and fountains along the way. Fig 9: A maze design published by Iohn Marriott in 1623. A similar design was published by Adam Islip in 1602. Fig 10: Design of a hedge maze in a painting by J. Fouquieres of the garden of Hortus Palatinus at Heidelberg laid out in 1613 to 1618. The corners had a few trees enclosed by the hedge. There is little solid evidence for hedge mazes before the 16th century, though it must be noted that topiary was popular at least as far back in history as Roman times, and also that gardens are not durable; they are redeveloped or replaced as time goes by. Popular species for hedges were box, yew, cypress, and hawthorn. One way of planting a hedge that was used in period was to rub the berries of the plant along an old rope, then store the rope over winter and in Spring lay it out in a shallow furrow and cover with dirt. Where the rope was buried, the hedge would grow. To ensure a hedge is thick all the way to the ground, it should be trimmed slightly narrower at the top and wider at the base to let more sunlight reach the lower leaves. Apart from Thesius, there are two other notable stories about labyrinths in period. One is a popular myth that King Solomon invented the Labyrinth, possibly adding weight to the naming of labyrinths after Middle-Eastern towns. The other story is about Rosamond, one of King Henry II's mistresses. King Henry II had a 'bower' built as a secret place to meet with Rosamond. This may have been a garden or hedge labyrinth, though was more likely to have been a large building with many rooms. According to legend Henry's wife, Eleanor of Aquitaine found her way in and poisoned Rosamond, and many poets decided it was such a good story that they wrote about it. This website focuses on the mathematical properties of single-path labyrinths. This article first appeared in issue 13 of Cockatrice.